Here I have for sale a Dell PowerEdge R210 server which comprises of the following specification Dell R210 chassis complete with bezel and rackmount rails. NO HDD Caddy. Tested to BIOS and working. Dell Poweredge R310 Server. 2.4Ghz Quad Core Xeon. 16GB DDR3 RAM. No Rack Rails. 500GB HARD DRIVE (Seagate Barracuda, SMART details shown in pictures). 2x Hard drive caddies included. Model: PowerEdge R710. Storage Capacity 600GB (2 x 2.5" 10K SAS). Total number of HDD 2 (2 x 2.5" 10K SAS). Make: Dell Inc. Total number of CPU 2. Dell Precision R5400 Fixed Rack Workstation. 2 X 1TB Hard Drives (Raid 1). Hard Drive. 16 GB (4x4GB) 667MHz DDR2. Light use as CAD pc in data centre. For sale is a Dell PowerEdge R620 1U Server. This server has been fully diagnostic tested and is in perfect working condition. 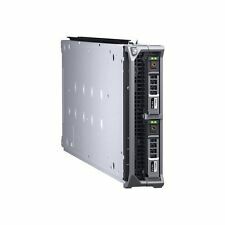 Dell PowerEdge R620 1U 8x 2.5" SFF Chassis. 2x Dell Enterprise 600GB 10K 6G SAS Hard Drives. This is a powerful Server that has been processed through our system. The full specification is detailed below and upgrades are available if required. Our Process for each Server involves About This Server. Dual Quad Core Xeon E5410 (2.33GHz, 2x6MB, 1333MHz FSB). 16GB ECC DDR2 667Mhz RAM. Quantity 1 off Dell PE 1950 III. This sale is for one PE1950 iii server only. 3 x 76GB 10K 2.5" SAS Hot Plug HDD. Type: Rackmount. Everything included in the sale is photographed. Anything not photographed is not included. Model No: PowerEdge R320. 3 x 2TB 3.5" SATA 6Gb/s 7.2K Hard Drive HDD - T31KM. 16GB DDR3 PC3L-10600R Ram (4x 4GB). Rack Mount ReadyRail Sliding Rails. (4 x 3.5" SAS Hard Drive Bays). Dell PowerEdge M610 Blade Server. In very good condition and in full working order. Dell PowerEdge T420. 6x 300gb 15K sas Drives fitted. These records are kept in a secure encrypted database and a paper copy format, none of your details are ever used for any other purposes. These records are mainly in form of invoices. Dell PowerEdge M620 Blade Server. 1 x 500GB SATA 7.2K 6Gb/s 2.5" Hard Drive. 16GB DDR3 RAM. 1 x Dell 57810S-K Dual Port 10GbE Network Daughter Card JVFVR. 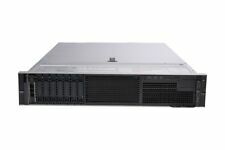 HP Proliant DL380P G8 Including HP Proliant DL380P G8 8 x 3.5" Bay Chassis. 16GB DDR3 RAM. Dell PowerEdge is a trademark of Dell Inc. HP is a trademark of HP Inc. PowerEdge is a trademark of Dell Inc.
2 x 146GB 10K Hot Swap HDD. For sale is this high spec Dell Poweredge R610 Server. All 11th generation servers are designed to make the experience easier. The PowerEdge R610 provides an interactive LED display positioned on the front of the server for ease of monitoring and troubleshooting condition of the server. Dell PowerEdge M520 Blade Server. 2 x 146GB 15k SAS 2.5" HDD. 1 x Dell H710 512Mb RAID DP/N: 62P9H. Dell T330 Tower (Front bezel and key included) Xeon E3-1240v5 @3.5Ghz 16GB DDR4 ECC RAM 2x450GB SAS 3.5” in hot swap caddies 6x2TB SAS 3.5” in hot swap caddies Win 2012 server Standard R2 2x450W PSU Please note windows isn’t installed on this unit, the sticker is attached to the case. Installation can be done upon request More server of similar specification and of different specifications available, please message or check my other items. Fully Tested, No problems, iDRAC factory reset. Model: PowerEdge M610. Storage Capacity 146GB - 2 x 73GB SAS 15k. Make: Dell Inc. Available for sale is a Dell Poweredge R420 1U Rackmount Server (2x Xeon E5-2440 (Hex Core/6 Core) / 24GB / No HDD / H310 Mini) 242. This item is tested and working, and has been reset to factory defaults. Perc H700 RAID. 2 x Xeon X5650 2.67GHx processors giving 24 usable cores. 3 x 146GB 15K SAS hard drives. Rack mount rails. 14 drive bays (12 on the front and 2 internal). Model No: PowerEdge R510. 16GB DDR3 PC3L-10600R Ram. Set of Rails - J7H9H/Y8P81. TH 203125 - HDD in box 203149. 16GB DDR4 RAM. HP Proliant DL380 G9 Including HP Proliant DL380 G9 12 x 3.5" Bay Chassis. HP Proliant DL380 G9 4-Bay Hard Drive Backplane (Upgrade-able to 12-Bay Backplane). Dell PowerEdge is a trademark of Dell Inc.
Dell Poweredge R710. 96GB DDR3 RAM( 48GB, 64GB, 96GB & 128GB Available ). DELL Poweredge Servers. Dell Poweredge 1950. Dell Poweredge 2950. Dell Poweredge R410. Dell Poweredge R510. Dell Poweredge R610. Tested by onsite technicians and in full working order. Excellent condition. Product Form Factor: Tower - 5U. Hard Driver: 2TB (with caddy). RAM: 2x 8GB DDR4. Number of Cores: Quad-Core. 2 x 146GB 10K Hot Swap SAS HDD. For sale is this high spec Dell Poweredge R610 Server. All 11th generation servers are designed to make the experience easier. The PowerEdge R610 provides an interactive LED display positioned on the front of the server for ease of monitoring and troubleshooting condition of the server. The T440 is an excellent fit for a wide range of office workloads, including work group collab. Product Model: T440. Rack Height: 5U. Processor Model: 4110. Product Family: PowerEdge. Processor Type: Xeon Silver.